MORE SQUANDERED OPPORTUNITIES TO DEAL WITH THE NEW COLD WAR | "Global Possibilities"
The enemies of détente with Russia sabotaged Obama’s proposed alliance with Russia in Syria while the American presidential debate ignored all the perilous issues inherent in the Cold War. § The Obama-Putin plan for a joint US-Russian military campaign against terrorist movements in Syria was disrupted by the acknowledged US attack on Syrian Army forces and then by an unidentified attack on a UN humanitarian convoy to Aleppo. Such evidence as we have strongly suggests that the attack on Syrian forces was not an “accident,” as American officials claim. Nor does it suggest that Russian-Syrian forces, which had no motive, attacked the humanitarian convoy, as US officials also claim. These developments raise the question, now openly asked in Moscow and even in the West: Who is making US foreign policy—President Obama or the Department of Defense and other enemies of détente? § The political impact has been negative both in Washington and in Moscow. In Washington, the Syrian fiasco has led to more vilification of “Putin’s Russia” and thus made proposals for US-Russian cooperation anywhere even more difficult. In Moscow, the collapse of the Putin-Obama attempted détente in Syria has resulted in scarcely veiled criticism of Putin’s “soft” diplomatic approach to Washington, expressed mostly in criticism of his foreign minister, Sergei Lavrov. § Movement toward a negotiated settlement of the Ukrainian civil and proxy war, where the new Cold War was firmly established and from which it spread to Syria and to the Baltic states, also faltered. There the problem remains as it has been for two years. Despite pressure from Europe, especially France and Germany, Ukrainian President Poroshenko has refused to grant the rebel Donbass provinces a degree of home rule, as required by the Minsk Accords. Europe now threatens to withdraw its support for Kiev altogether, leaving Washington as Poroshenko’s primary, and perhaps only, major backer. This emerging truth was illustrated last by US-coordinated efforts to bolster Poroshenko’s crumbling standing in his own country, which included a meeting with Hillary Clinton and various Washington officials, and appearances at the Council on Foreign Relations and on Fareed Zakaria’s CNN show. None are likely to help Poroshenko at home, where his popularity is low and his ultra-right enemies numerous and armed. § Unlike during the preceding Cold War, there is no real discussion of perilous issues in the mainstream media, which continue to blame all aspects of the new Cold War solely on Putin and Russia, or even in the ongoing presidential campaign. Once-gold-standard media degenerate almost weekly—even apart from their neo-McCarthyite slurs of Trump­—from The New York Times to CBS News’s 60 Minutes. On September 25, for example, 60 Minutes presented a segment on nuclear weapons that can only be characterized as Strangelove-like, nuclear warmongering without any dissenting voices. 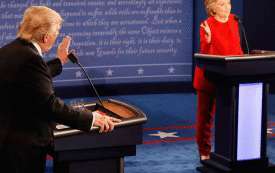 Still worse, at the presidential debate on September 26, though Trump raised several issues at least elliptically, neither candidate discussed the Syrian or Ukrainian crisis, the new nuclear-arms race, or the larger issue of cooperation instead of Cold War with Russia. Nor did the moderator, Lester Holt, who apparently thought such existential dangers did not warrant time for debate—or knew nothing about them. § What continues to make the new Cold War more dangerous than the preceding one is in large part its near-total absence from American political discourse, certainly from any critical discussion, in sharp contrast to the intense discussions under way in Europe and in Russia. In that regard, America truly is exceptional.